Gringo Bandito Hot Sauce is a delicious sauce that can be added to pretty much anything. It has so much flavor, but nothing too hot at all. This sauce has a medium spice level. 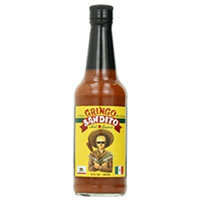 Gringo Bandito is light reddish-orange in color with a watery consistency. Gringo Bandito is one of my favorites because I can add it to burritos, tacos, eggs, rice, crockpot meals, and so much more. I have to admit that the medium spice level is perfect for people who want a hot sauce but cannot handle intense burn. It’s a sauce that almost everyone, of all ages, can enjoy! It smells like a mix of peppers and spices. It has a slight spiciness to the scent. The spice level is medium. I wish there was a little more spice, but I do love that it’s a sauce that can work for almost anyone, even kids. I tasted Gringo Bandito Hot Sauce on chicken and it added so much flavor. It has jalapeno pepper, which is my favorite pepper because it tastes amazing, but also has a little spice! However, what makes this sauce unique is that it also has chili pepper and habanero pepper. The mix of peppers creates a variety of flavor and ultimately an amazing sauce. It’s the perfect unique touch of spice and flavor for my family, but I do wish it had a little more spice to it. But overall, it’s has a phenomenal depth of flavor. Gringo Bandito has very few ingredients. The main ingredients are Peppers, Salt, Vinegar, and Spices. Like I said, this mix of Habenero, Jalepeno, and Red Japanese Chili Peppers creates a taste different than any sauce I have tried before. I am not sure what it is about this mix of ingredients, but it creates a delicious sauce with a variety of flavors. I love that you can taste each of the peppers because they all bring so much flavor to the sauce. The 10 oz bottle costs $6.89. That’s a very affordable price for a hot sauce.